As a fan of public access television, I created this based on my school’s TV show, BRCC Today. This concept has since come to fruition. I currently attend the Acadian Thruway campus of Baton Rouge Community College, the site of the former Capital Area Technical College and Louisiana Technical College – Baton Rouge. My instructor, Ms. Angela Saia, strongly advocates us snapping photos of our classwork and sharing it the masses; I’ve always followed her advice, and this is no exception. This page will be used to display my development and training throughout my time with her. This semester, we worked on signage for the different campuses as a result of the BRCC/CATC merger. In addition, we worked on our own personal newsletters. As a class, we got hands-on training in the various digital pre-press processes, including laser engraving, paper binding and screen printing. The primary software we used this semester are Adobe’s Illustrator, InDesign and Photoshop. Ms. Angela showed me how to vectorize and clean up my logo, but my relationship with Illustrator remains so-so. Already adhered to application tape, I chose this template because the “R” was crooked, making it stand out. This would’ve allow me to spot it in the parking lot. However this sign was used at different campus. My rather annoying raster (pixel-based) logos were converted to vector, or line-based, using the Live Trace feature in Adobe Illustrator. The Back has a torrent of old and new prepress technologies, including this silkscreen station. With screens pre-made by another classmate, I sprayed adhesive or “Pam” to the mount. After mounting my substrate, I pressed down the screen. You have to forcefully spread the ink over the screen, pulling the squeegee towards you. The final process consists of passing the design through a heater. In November, Mid City Merchants, a community of small business around Mid City Baton Roue, called for our department to make twenty double-sided signs to place long Government St., advertising their White Night Light art showcase on November 22. Things were going perfectly when our morning class plotted and weeded the vinyl, but things went awry in the evening classes. The next morning, we had to fix damn near every sign because the other students’ carelessness. No worries, Javan H. rescued as many signs as possible. Below is my documentation of the process. …this is a small portion of the signs that needed repair. Many of them weren’t even complete. Weeding is always done with an Xacto knife. …and twenty for the road. Having inserts like this was a must, as it’s found in nearly every publication. We had eight criteria/categories to devote pages to. But because of the concept I had in mind, I created a thumbnail sketch and draft, which resulted in me placing multiple categories on one page. Though bitmapped (pixelated), the cover image is a screencap from my fourth Shuttle launch, which is part of what the newsletter’s content is about. Multitasking, I was also designing my seventh Shuttle mission. In the Graphics center, or “The Back” as we call it, I did my prepress duties. Special thanks to Tary for snapping these two pictures. The cover photo below is a downloadable copy of the newsletter, and beneath that is gallery of the spreads for this “My Day in History” assignment. Our first assignment was a portfolio–a follow-up to a business card assignment we did last semester. Ms. Angela suggested we use Illustrator, but we were allowed to use InDesign which, for me, made the assignment easier. Our portfolios were to consist of a cover page, followed by a series of pages that descend in length down to a business card. After some trial and error in InDesign, the portfolio was finally ready to print on this copier in The Back. Crop marks were made on my pages, serving as indicators for me to cut. …and here is the final output. The cutter is an older machine, so the massive blade isn’t the sharpest. …and here they are in order. I sliced holes in the 110lb index paper–a form of card stock–to slide my business card in. The papers on the right are the thumbnail sketch, a required rough draft of the layout. In March, our class took a field trip to one of the Lamar Advertising offices here in Baton Rouge. We went to Lamar Advertising in one of BRCC’s Ford vans. This mural in the Lamar lobby features a series of Waldo characters (Where’s Waldo?). Barb, at right, was our tour guide. These are the large machines responsible for printing on the substrates. This division prepares the billboards for display. This, however, is sort of a large-scale Singer sewing machine. This device hems the edges of the prints. Jerome Rankin is the silkscreening whiz in my class. Behind him is a screen used for company signage. As of Fall 2014, he’s now a full-time instructor. Towards the back of the building was the 3D department. Here are some molds, as well as past designs. A little Gorilla Glue goes a long way. In this area, the staff is responsible for some of the structural parts of the ads. After the warehouse tour, we sat with one of the design/marketing managers for Lamar. …as well as tips and backstories of some of work. My next assignment was a two-color design. Most of the students did things the cheap way by choosing a simple picture and putting it in Photoshop. But that’s not how I roll. I designed a newsletter akin to the one mentioned above. However, it followed the theme of my old job’s newsletter, ‘The Source.’ This two-color newsletter archived some of my favorite dream logs that I’ve posted on this site. To view it, click the cover below. My final assignment for the semester was to design a button. By this point, I was deep working with Tammy Brown and the school’s interview show BRCC Today. I had now become a full-on independent producer, so I designed my button based on that. I created this all in one day, probably an hour from start to finish. The button was designed in Adobe Illustrator CS4. I guess this button accompanies my laser engraved Shuttle dogtag from first semester. My second semester flew by, partly due to the fact that I was busy with BRCC Today and other local TV projects. However, none of that barred me from completing all of my work and remaining on the Dean’s List. This did disappoint Ms. Angela a bit as my next assignment was for Typography. However, she did let me use PowerPoint to finish an existing font. For GRPH 1300–Typography, I chose to do more work on my Michaela font family, named after one of The Real Housewives of D.C. (remember the party crashers?). Full disclosure, I always liked the names ‘Stephanie’ and ‘Michaela’ for a girl, and I happened to be watching DC Housewives reruns while designing; I was 21 at the time. 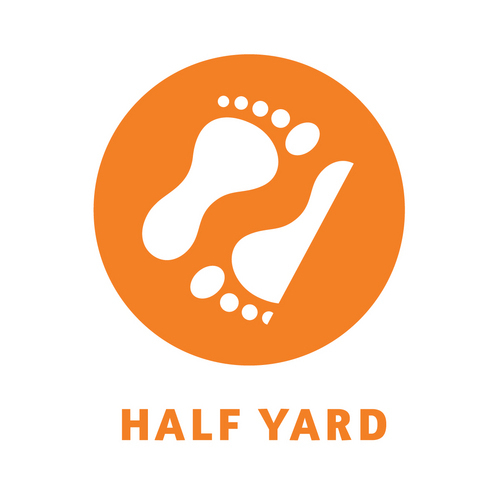 Let me go off into a tangent for a bit: that show was produced by Half Yard Productions. I’ve seen their logo on TV for years, but only recently did it make sense to me. Take a look at it below, then think carefully about the name. It was during the production company’s 2014 run of 100 Days of Summer that I realized the “foot and a half.” The math: one yard is thirty-six inches. Half of that is eighteen inches, or a foot and a half–a half yard. I thought this was GENIUS! However, this semester was the perfect opportunity to get back on track, designing Michaela Flourish. The original kerning of the glyphs (spacing of the lettering). Markers were used to keep everything consistent and aligned. Midway through this assignment, my inflated ego chose to take on some extra credit. About a quarter of the way through the semester, I saw this massive 5’x8′ banner reading “BRCC Acadian Campus” in giant letters. They were made as signage for the exterior of our campus, and Ms. Angela needed another one done. Feeling myself, I lunged at the opportunity, completing it with help from two other classmates. …and these are the letters Ms. Angela plotted and weeded the day before. Make sure all of it is covered. Myriad Pro is my official font, as well as the school’s. So I was SO sure I got the kerning right that I decided to take a pic. However, Ms. Angela brought me back to Earth, showing me some shortcuts to align the letters properly. Come to find out, I was quite off, but not my much. Somehow, I failed to notice that Ms. Angela left marks to show where the letters drop below the baseline, as the curved letters in most fonts do. Now that everything was squared up straight, it was time to adhere. Notice the difference in the color of the vinyl. Pantone’s Tomato Red (right) is the correct color. From here, Ms. Angela and I poked out the air pockets. It never hurts to have some spare letters, as the vinyl is easy to remove and replace. In other words, once the sign has been exposed to the elements, the imperfections will vanish, and the adhesive would have set in permanently. Mine was hard to miss, as not only did it face the front of the school on Acadian Thruway, it was also plotted in the correct Tomato Red vinyl. But after a few weeks, those signs were replaced by ones that had the actual BRCC logo. I went ahead and let the rookies–the new kids–handle those so that they could pay their dues. WHAT PART OF LABOR FOR EDUCATION DON’T YOU UNDERSTAND? Our other assignment for Typography was to use our font in an application. 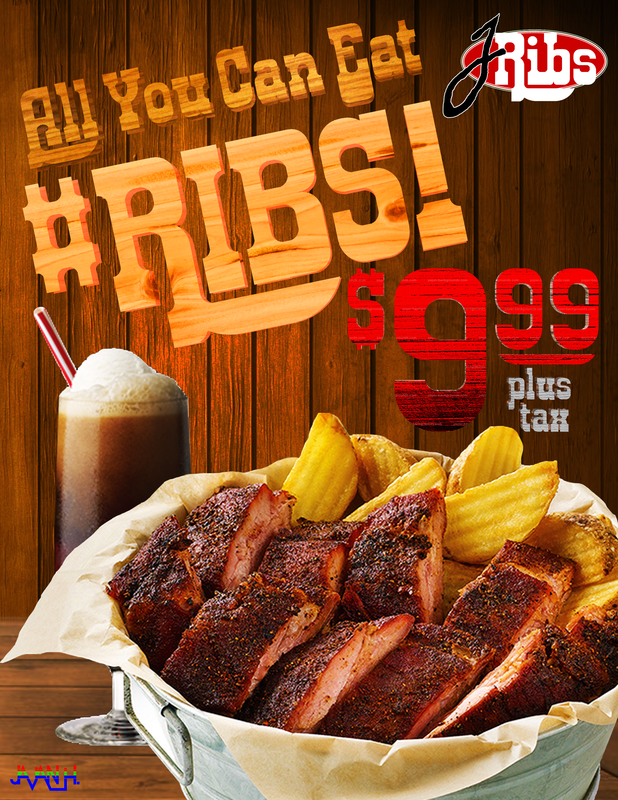 I my case, I chose to create an ad for the cleverly-titled J Ribs, complete with fries and a Barq’s. …I fell madly in love with Adobe Illustrator!!! So much that it’s inspired me to soon buy a set of Adobe Mnemonic pillows for my room, which doubles as my production office. Unfortunately, I’m unable to show what I’ve worked on as again, it relates to a TV show that’s currently in development. Lastly, we had to a create brochure about anything we wanted. By this time, I was hot and heavy with filming, quickly developing my own style and technique. That inspired me to do my brochure on DSLR videography. I named it ‘The Quickest, Fastest, Cheapest Guide to DSLR Videography’ in honor of Ms. Angela, as “quickest, fastest, cheapest” is one of her many Saia-isms. Please check out the guide by clicking on the picture above, and also take a look at our appreciation lunch for Ms. Angela below. By this point, I’m all over the map. On one hand, I’m helping develop a new show for the Baton Rouge market, which had all sorts of ups and downs. On the other hand, MyScene TV is coming out of hiatus, and on the third hand, I was juggling various personal, family and especially social issues But on the fourth hand (at least fourth), I’m being hounded by the school about my work-study, which I was ultimately removed from because of an oversight. The previous semester, I had to report the financial aid secretary who supervises the work-study program; she clearly had an issue with me. However, this latest situation was different. Rather than waste any more time it, I kept on going. 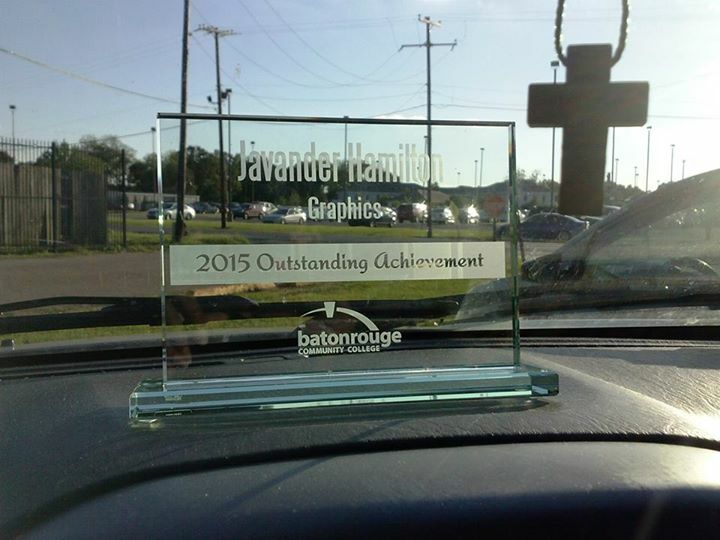 Ms. Tammy had been promoted to Site Administrator of the Westside Campus, which led to her being moved to Plaquemine. Because of this, I was only able to get out one more video, as neither of us had much time on our hands. With all of the above taken into account, this semester’s assignments revolved around my own branding. Graphics for the TV shows served as Visual Design (Photoshop) assignments, but for Special Projects (SPPR), I chose to re-design my business cards–something more representative of me. This is the original one from either first or second semester. Here, I just grasped at something; it doesn’t say much. Where’s the design? Where’s the style? Where’s the technique? I was also hella uninspired during that time. I was steadily reminded of it this semester, as my whole demeanor was different. But now that my name was out there, I needed something that popped. I recently completed the Javan H. Virtual Set, which I have billed as “the most customizable virtual set in Louisiana.” Of the three TV projects I’m involved in, two will be using it; their crews and the business advisors are in love with it. In tandem, I discovered ‘spot UV,’ the technique of placing a UV coat over a specified area. After a little bit of research and a lot of inspiration, I came up with this. Now, I’m completely done with all of my assignments. Two years of labor for education resulted in a lifelong career goal coming to life…completely out of nowhere! To remind you, I’m in broadcasting, while this program is for print graphics. But with all that I’ve learned, I’ve yet to do one of the most basic tasks, something that the other students always look forward to: designing a T-shirt. While shadowing Brian Hertzock in 2014, one of the first things I was reminded of was that production crew always wear black. Just like in the service industry, it establishes neutrality. This has been my rule since then, but I still wanted a shirt that would serve as a billboard when filming out. Here, I had the choice of silkscreen or PolyFlex (vinyl). I chose PolyFlex, not only because I’ve done silkscreen before, as seen above, but for what I was doing, it wasn’t worth burning screens, doing this, that and the third. Another one of my favorite Saia-isms is “…what’s quickest, fastest, cheapest.” For me, this method hit all three points. Using my favorite stretch-cotton T-shirts from Express, created outlines of my clapperboard icon, as well as my logo, its icons and a nod to my IMDb page. …and this is your vinyl. Some are for signs, and some are for textiles. …and a tiny precision blade etches your design. Because this is basically an iron-on, the design should ALWAYS be reversed. They should also be Illustrator (vector) files. The coloring of the illustration doesn’t matter. You just want your outlines to be correct. From there, you open up your “plot” in CutStudio. Linked to Illustrator, the software, from what I know, comes with the machine. Like something out of “Casper,” your design is now plotted into the vinyl. However, you do have to look closely. Just like signmaking, you have to carefully weed the unneeded PolyFlex (vinyl) from the design using an Xacto knife. Special thanks to Mrs. Janice Bonner-Davis. I got a late start, so I used wax paper to protect the adhesive. I came a day or two later to finish. Let’s cut it on. Per Ms. Angela and Ms. Ann, I set the heat press to 325. It’s recommended that you wait about twenty minutes for it to fully heat. The time was set to twelve seconds. This is the amount of time the heat is to be applied. Afterwards, a loud buzzer will sound. …as well as your design. This way, they’ll line up. Using a square, make sure everything is even. I decided to line the very edge of the collar with the platform. The rule is that the design should start three inches below the collar. Crossways, I used the square to make sure the design was, in fact, even. From there, you cover everything with parchment to prevent scorching. Special thanks to my boy, Alonzo Shropshire. Because this is a heat application, you’ll get an imprint. It’s wise to use that imprint, as well as the folding technique from earlier, as a guide for the back design. It should begin about seven inches below the shoulder hem of the sleeve. …a walking billboard with brand-spanking-new business cards to match. Special thanks to Ms. Ann Nelson. I graduated from Tara High School in 2007, choosing BRCC because I didn’t complete my financial aid in time; I was accepted into UNO. I had only completed one semester, before spending three years chasing pipe dreams, making bad friends and attempting suicide twice for reasons too numerous. But as the dust settled, I returned to BRCC, picking up where I left off for the Fall 2011 semester. My grades were great, and my writing assignments were so on-point, that Mrs. Mary McKeough had to double-check for plagiarism. I eventually landed a dead-end yet well-paying job at a very unsafe library. Clawing for a way out, I felt the need to jump ship from the school I loved, to an old building in a questionable area, a place I only knew about through a former friend who was enrolled in Graphics at the time. I set foot in Room 130, with the latest BRCC Today broadcast playing in my head. Two people were in front of me as I tried to get into Ms. “Sigh-UH’s” office. I went to class at 7:00am every morning with the most rotten disposition, angry at the world, angry at everyone whether I knew them or not. Flashing out in front of my goddaughters, cursing out patrons at work, smashing things, holes in walls–I was in a very ugly place at the time. But one Sunday in January 2014–second semester–I met four missionaries while filming random footage at the river; it was sunset. This is when I found my faith, and from that very day, everything changed. It was around that time when Ms. Angela, having seen my work one very bad morning first semester, sent me to Ms. Tammy’s office. That day in April 2014 would become to rest of my life. This is why I heavily advocate both faith and education (there’s a difference between faith and religion). I did as much as I could how I could, and it culminated with a 4.0 GPA and an academic honor…all after having the rare opportunity to rub elbows with the chancellor. And I have Baton Rouge Community College to thank for it.